Oasys Ltd is the software house of Arup and distributor of the LS-DYNA software in the UK, India and China. We develop the Oasys Suite of pre- and post-processing software for use with LS-DYNA. We have been working with Livermore Software Technology Corporation (LSTC), the developers of LS-DYNA, for over twenty years and have an in-depth knowledge of this powerful analysis tool. During this period we have also been involved in developing some of the features within LS-DYNA such as seatbelt system modelling, staged construction, and various material models. The Oasys Suite of software, exclusively written for LS-DYNA, is at the leading edge of the pre- and post-processing markets and is used worldwide by many of the largest LS-DYNA customers. 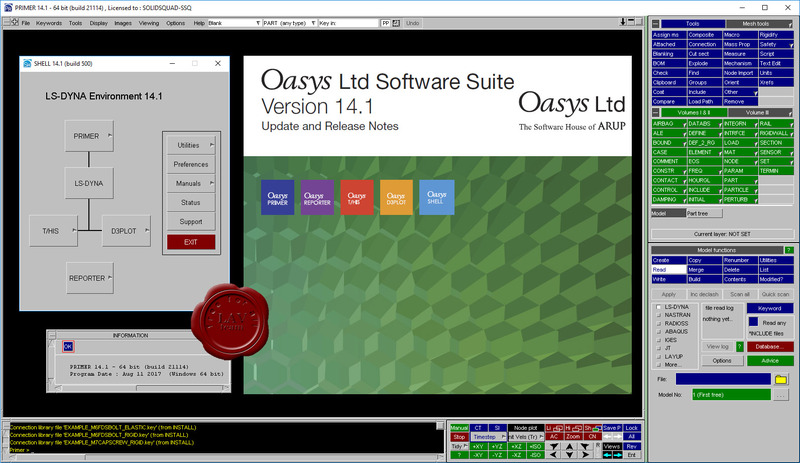 With the release of version 14 the Oasys Suite provides the user with even more tools and functions to reduce the amount of time needed to build and check a LS-DYNA model, allowing the engineer to concentrate more on the actual problem in hand rather than just the task getting a model up and running in LS-DYNA.